The Museum of Fine Arts, Houston, presents "James Turrell: The Light Inside"
HOUSTON, TX.- The Museum of Fine Arts, Houston, presents James Turrell: The Light Inside, one of three simultaneous and complementary exhibitions devoted to the lifes work of James Turrell. Since the mid-1960s, Turrell has employed the medium of light, both artificial and natural, to create site-sensitive installations and monumental environmental projects. This exhibition is presented by the MFAH in conjunction with related exhibitions at the Los Angeles County Museum of Art and the Solomon R. Guggenheim Museum, New York. Each institution presents a range of works to illuminate Turrells dynamic five-decade career, from his early installations made with projected light to his mapping of the heavens at Roden Crater, the monumental "naked-eye observatory" Turrell has shaped within a dormant volcano near Flagstaff, Arizona. The exhibition is open at the MFAH from June 9 through September 22, 2013. "James Turrell has worked with the medium of light to create some of the most extraordinary and deeply beautiful art of our time," commented Gary Tinterow, MFAH director. "He is among the handful of artists who can be credited with changing the course of American art. We are particularly proud to own so many key examples of his work, which we will present in conjunction with the parallel exhibitions conceived by our colleagues in Los Angeles and New York." Alison de Lima Greene, MFAH curator of contemporary art and special projects, is organizing the Houston segment of the exhibition in close collaboration with the artist. "The MFAH first began planning this exhibition more than a decade ago, shortly after Turrells The Light Inside was commissioned for The Wilson Tunnel that links our two buildings, she commented. "We have shaped our project around this museums unique and extraordinary holdings of Turrells work, including the series of light-based installations that he has identified as his 'Vertical Vintage,' which the museum acquired in 2010." James Turrell: The Light Inside is entirely drawn from MFAH holdings of Turrells work. The major part of the exhibition has been installed in the 22,000 square-foot galleries of the museums Brown Pavilion, designed by Ludwig Mies van der Rohe. Surveying the artists ongoing exploration of light, the installation opens with the simple white light of Tycho, an early double projection from 1967 that pays tribute to the "zips" of Barnett Newman, and closes with the evolving and nuanced color harmonies of Aurora B (2010-11) from the artists "Tall Glass" series. Both these works are having their public debut with this installation. Other works in the exhibition engage and challenge viewers to test the limits of their perception, culminating with the magnificent End Around (2006) Ganzfeld, or "complete field," which engulfs the viewer in a pure, seemingly limitless field of light. Additionally, the artists vision for Roden Crater is documented by the exquisitely printed Deep Sky (1984) and Mapping Spaces (1987) portfolios from the Peter Blum Edition Archive at the MFAH. Also on view is Turrells The Light Inside (1999), a special commission permanently installed in The Wilson Tunnel that connects the museums two gallery buildings. The MFAH has had a long and rich history with James Turrell, supported over the years by Houston philanthropists and beginning in 1994 with acquisition of the artists First Light portfolio. The museums 1996 purchase of the Peter Blum Edition Archive, made possible by the Alice Pratt Brown Museum Fund, brought more than 100 major prints, working proofs and printing plates by Turrell into the museums collection. In 1999, MFAH patrons Isabel B. and Wallace S. Wilson commissioned Turrells The Light Inside to link the Caroline Wiess Law Building with the then-newly built Audrey Jones Beck Building. The museum has continued to maintain its commitment to Turrell with other significant purchases, including the 2008 purchase of Acro, Green (1968) from the artists "Projection" series. In 2010 the MFAH made the commitment to acquire the artists "Vertical Vintage," a career-spanning survey of twelve light-based installations, a landmark for Houston. 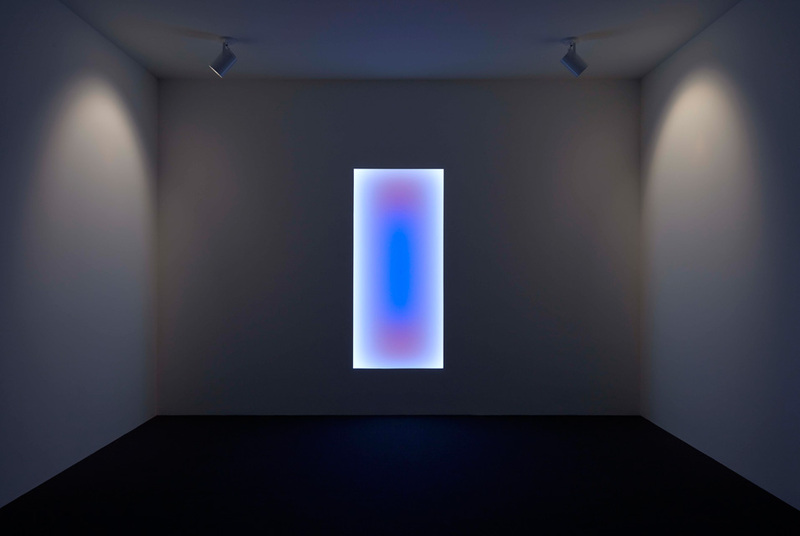 A gift of the estate of Isabel B. Wilson in memory of former MFAH director Peter C. Marzio, "Vertical Vintage" is the most retrospective overview of Turrells light-based work in a public collection. Houston is also home to two important Turrell Skyspaces, which address the changing light and conditions of the sky: The Live Oaks Friends Meeting House, created in 2001, and the recently inaugurated Twilight Epiphany, at Rice Universitys Suzanne Deal Booth Centennial Pavilion, created in 2012. The MFAH is planning special programs with both of these institutions in conjunction with James Turrell: The Light Inside. Born in Los Angeles to Quaker parents, James Turrell attended Pomona College, where his studies concentrated on psychology and mathematics. In late 1966, during his first semester in the newly launched graduate program at the University of California at Irvine, Turrell discovered a means to work purely with light. He left school and established his Main and Hill Studio in the former Mendota Hotel in the Ocean Park district of Santa Monica. Using a high-intensity projector, he embarked on a series of light installations by casting a tightly framed beam of light across a room onto a mural surface. Where the light hit the wall (or corner) it became a sharply rendered geometric form, both defining and dissolving the space around it. In the fall of 1967 he presented these first Single Wall and Corner Projections at the Pasadena Art Museum. This ground-breaking exhibition established Turrell as a leader among the artists who were shaping Southern Californias nascent Light and Space Movement. Following the Pasadena exhibition, Turrell continued to develop the relationship between light and the architectural frame. The resulting series of "Light Spaces," "Shallow-Space Constructions" and "Wedgeworks" manipulated light so the viewer becomes aware of light as an elemental force and as a tangible material primary to the existence of color. He also began a series of works dependent on external and natural light sources, at times literally cutting through the walls and roof of his studio. From these experiments emerged his first permanent Skyspace, created in 1974 for Count Giuseppe Panza di Biumo at his family home in Varese, Italy. A 1974 grant from the Guggenheim Foundation allowed Turrell to begin what would become his most ambitious project, the transformation of Roden Crater, outside Flagstaff, Arizona, into a naked-eye observatory. Now nearing completion, Roden Crater exists at a scale unmatched by any artwork of our time, as Turrell has carefully shaped its obdurate mass, creating a vessel for light that defines our place on earth and reaches to the sun, the moon and stars millions of light-years away. For Turrell, the Roden Crater offers "a stage of geological time where the landscape of our thoughts is united with the infinite." James Turrell enjoys acclaim both in America and across four continents. In 2011, the American Academy of Arts and Letters announced Turrells election and Turrells work was included in the 54th Venice Biennale, within the ILUMMInations pavilion curated by art historian and critic Bice Curiger. Turrell has also been featured in numerous exhibitions following his first introduction at the Pasadena Art Museum (1967). Other notable exhibitions include major presentations at the Stedelijk Museum, Amsterdam (1976); Whitney Museum of American Art, New York (1981); the Musée dArt Moderne de la Ville de Paris (1983); the Los Angeles Museum of Contemporary Art (1985); the Hirshhorn Museum and Sculpture Garden, Washington, D.C. (1986); the Kunstmuseum Bern (1991); the Contemporary Art Center, Art Tower Mito, Japan (1995); the Contemporary Arts Museum Houston (1998); and the Kunstmuseum Wolfsburg (2009), among many others. Additionally, more than 70 of Turrells Skyspaces have been created in the Americas, Europe and Asia. Two permanent Skyspaces are accessible to the public in Houston.